Another thing public transit saves is the stress of being stuck in traffic, lines of cars fighting for a parking spot at the mall parking lot (that is moving slow as molasses and even thicker to navigate through). The trend of increasing ridership is stable and growing. As US public transportation improves, it is outpacing urban vehicle miles traveled (VMT) at times. Record ridership has increased on the expanded and new lines opened in the past five years, proving that the investments are paying off. With better options, people will choose public transportation. 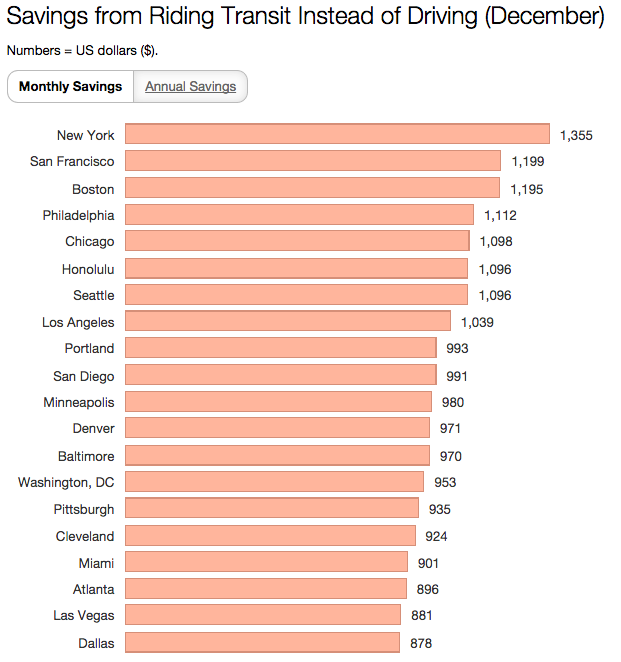 The top 20 cities with the highest public transit ridership are ranked in order of their transit savings based on the purchase of a monthly public transit pass. The savings also factor in local gas prices for November 24, 2014 and the local monthly unreserved parking rate. Transit Savings Report continually shows that living with one less car in a two-person household can save you a ton of money, rewarding you for being practical and wise financially. At the same time, this choice mitigates air pollution and global warming. 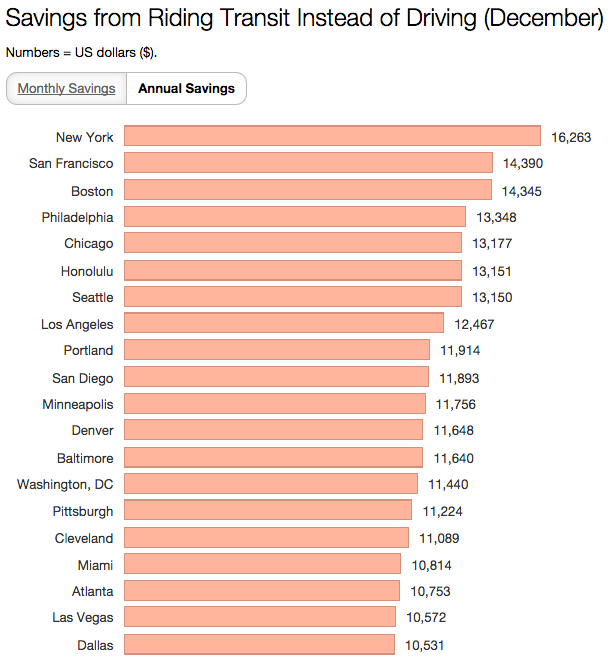 There are even more savings if both commuted by transit and let go of the automobile, of course. Car-sharing services are also available in many cities now, giving the ability to cut car ownership without losing mobility. Along with regular use of public transit, one can supplement an automobile with programs such as DriveNow, Zipcar, Car2Go, Autolib for short periods. The Inspired Economist‘s feature on smart cities and TEDCity2.0, entitled “Why buses represent democracy in action,” makes this issue even more relevant, discussing our need to change the transportation dynamic to build better cities. As in Columbia, so it is in Europe, where even the wealthy take the metro. Check out Zurich, Switzerland, a beautiful city that invites you to come and enjoy the world in person, rather than trying to navigate an unknown place in a plastic, metal, and glass bubble.